Sarah URIDGE was baptised on 25 August 1816 at Hoo St Werburgh, Kent.1,8 She married William BAXTER on 11 December 1835 at Hoo St Werburgh, Kent.5,9,10 Sarah and William BAXTER emigrated on the ship "Woodbridge", which left London under the command of Captain Dobson on 6 May 1838, and arrived at Sydney on 15 September 1838. Also on board were Sarah's sister Caroline with her husband David WEBB and their children, Charlotte eight, George seven, and William three years old. Also David WEBB's older brother Robert and his wife Mary Ann and their four-year-old daughter Elizabeth. [S950] Website Family Search (LDS) (http://www.familysearch.org). [S364] Baptisms, Hoo St Werburgh, Kent, 1807-37 "P190/1/3 "Sarah d George & Frances URIDGE, Hoo, Labourer"" Searched by Raymond Godfrey 26 November 2002. [S15] Letter from Kevin Brady to Teresa Pask dated 23 June 1985. [S101] E-mail from Keri Webb to Teresa Pask states dob is 13 April 1814., dated 8 September 2001. [S26] Index of Baptisms, Marriages & Burials in the Parish of Hoo St Werburgh, Kent. [S364] Baptisms, Hoo St Werburgh, Kent, 1807-37 "P190/1/3 "Sarah d George & Frances URIDGE, Hoo, Labourer". Entered twice in baptism book." Searched by Raymond Godfrey 26 November 2002. [S61] Letter from Michael Gandy to Teresa Pask, dated 4 July 1985. [S101] E-mail from Keri Webb to Teresa Pask dated 8 September 2001. [S104] Website First Families 2001 (http://firstfamilies2001.net.au) www.firstfamilies2001.net.au 2 October. [S101] E-mail from Keri Webb to Teresa Pask transcript of bible, states Mount Druitt, dated 8 September 2001. [S101] E-mail from Keri Webb to Teresa Pask dated 26 December 2006. [S959] Website Rootsweb (http://www.rootsweb.com) Land Records 27 July 2000. [S950] Website Family Search (LDS) (http://www.familysearch.org) "England Births and Christenings, 1538-1975," database, FamilySearch (https://familysearch.org/ark:/61903/1:1:JW22-P5V : 30 December 2014), William Uridge, 24 Oct 1830; citing SAINT WERBURGH HOO,KENT,ENGLAND, reference ; FHL microfilm 992,521. [S364] Baptisms, Hoo St Werburgh, Kent, 1807-37 "P190/1/3 "William s Philip & Sarah URIDGE, Hoo, Labourer"." Searched by Raymond Godfrey 26 November 2002. [S807] Image of the 1841 Census census for Saint James, Isle of Grain, Kent: HO107 Piece 458 Book 5 Folio 7-8. [S806] Image of the 1851 census for Perry's Farm, St. James, Grain, Kent: H0107 Piece 1609 Folio 602 Page 13 Indexed incorrectly under the name of ELRIDGE. [S1009] Website New York Passenger Lists, 1820-1957 (http://www.ancestry.com) Name: Philip Wridge Arrival Date: 26 May 1851 Estimated Birth Year: abt 1804 Age: 47 Gender: Male Port of Departure: London, England Destination: United States of America Place of Origin: Ireland Ethnicity/Race­/Nationality: Irish Ship Name: Falcon Port of Arrival: New York Line: 42 Microfilm Serial: M237 Microfilm Roll: M237_98 List Number: 577 Port Arrival State: New York Port Arrival Country: United States. [S959] Website Rootsweb (http://www.rootsweb.com) Land Records: Land Record Document # 32803, Serial #: MI0960_.163; Sale Type: 272002; Acres 0.000; Meridian or Watershed: 19; Parcel: Township 14N, Range 15E, Section 3. Found 27 July 2000. [S801] Image of the 1860 census : Delaware, Sanilac, Michigan; Roll: M653_558; Page: 0; Image: 469. Incorrected enumerated under the name of HERRAGE. [S800] E-mail from Ellen Kennedy to Teresa Pask dated 20 April 2008. [S802] Image of the 1870 census : Delaware, Sanilac, Michigan; Roll: M593_703; Page: 31; Image: 62. [S449] E-mail from Philip Dorland to Teresa Pask dated 11 October 2014. [S952] Website Find A Grave (http://www.findagrave.com) Find A Grave Memorial# 81834030. Film Description: 1876 Wayne - 1877 Mason. [S800] E-mail from Ellen Kennedy to Teresa Pask dated 20 April 2008: Sanilac County Death Records, Book 2, Page 162. [S1013] Image of the 1900 census : Source Citation: Year: 1900; Census Place: Delaware, Sanilac, Michigan; Roll: 743; Page: 1B; Enumeration District: 0119; FHL microfilm: 1240743. [S950] Website Family Search (LDS) (http://www.familysearch.org) "Michigan, Death Certificates, 1921-1952," index, FamilySearch (https://familysearch.org/ark:/61903/1:1:KF7C-HTT : accessed 8 June 2015), Mary Uridge, 23 Apr 1937; citing Delaware, Sanilac, Michigan, United States, Division for Vital Records and Health Statistics, Lansing; FHL microfilm 1,973,092. [S449] E-mail from Philip Dorland to Teresa Pask dated 1 June 2015. [S6] Teresa Pask's Guesses, Theories and Speculation : On the basis that he went to Michigan about that time. Or could be his brother Philip. [S950] Website Family Search (LDS) (http://www.familysearch.org) "Michigan, Births, 1867-1902," index and images, FamilySearch (https://familysearch.org/ark:/61903/1:1:NQC4-QXX : accessed 8 June 2015), Uridge, 20 Dec 1883; citing item 3 p 180 rn 464, Delaware, Sanilac, Michigan, Department of Vital Records, Lansing; FHL microfilm 2,320,697. [S2] GRO Indexes to Births "1855/Q4 URIDGE, Alice Maria St Luke 1b 490." [S854] Baptism, St. Luke, Old Street, Middlesex, Page 173 November 1855 "London Metropolitan Archives, Saint Luke, Old Street, Register of baptisms, P76/LUK, Item 019: Alice Maria Uridge baptised 11 November 1855 born 15 September 1855 daughter of William & Sarah Uridge of 39 KIngs Square. Father's Occupation a Messenger." [S959] Website Rootsweb (http://www.rootsweb.com) http://freepages.genealogy.rootsweb.com/~abneypark/name/…. Burial Record: 015134; Section: E07; Index 1-MA. 27 December 2001. [S854] Baptism, St. Luke, Old Street, Middlesex, Page 173 November 1855 "London Metropolitan Archives, Saint Luke, Old Street, Register of baptisms, P76/LUK, Item 019: Alice Maria Uridge baptised 11 November 1855 born 15 September 1855 daughter of William & Sarah Uridge of 39 KIngs Square. Father's Occupation a Messenger. [S20] Website Miscellaneous (IGI/BI www.familysearch.org 23 February 2002). [S20] Website Miscellaneous (IGI www.familysearch.org 29 March 2001). [S95] E-mail from Caroline Gurney to Teresa Pask dated 14 May 2001. [S4] GRO Indexes to Deaths "1856/Q1 URIDGE, Alice Maria St Lukes 1b 355 age 0." [S20] Website Miscellaneous (27 December, 2001 http://freepages.genealogy.rootsweb.com/~abneypark/name/…. Burial Record: 015134; Section: E07; Index 1-MA). [S42] Miscellaneous SOG Material (information to be verified). [S80] Website English Origins (http://www.englishorigins.com) Vicar-General Marriage Licence Index Searched 23 Jan 2001. [S950] Website Family Search (LDS) (http://www.familysearch.org) searched 23 February 2002. In a document dated c1905, he is referred to as "(dead) has left four children in Australia 1. Mrs Caroline Dear 2. Thomas Uridge 3. John Joseph Uridge 4. Richard Uridge all of full age (see letter of H. E. Uridge July 12th 1905. )23"
He was buried at Plot 08/B/O2/011, Karori Cemetery, Wellington, New Zealand; Monumental Inscription reads: "In loving memory of Thomas URIDGE d 25 Oct 1897 a 53 yrs. Harriet HAIR (URIDGE) d 14 Jan 1929 a 85 yrs. 'Absent from the body, present with the Lord'. [Munro]19"
[S878] Website Births, Deaths & Marriages Online New Zealand (https://www.bdmhistoricalrecords.dia.govt.nz/home/) Birth Index: 1878/12597 Uridge Richard William Harriett Thomas William. [S2] GRO Indexes to Births "GRO Online Index: 1844/Q4 URIDGE, Thomas DROVER Lewisham 5 307." [S1034] Website Ancestry London Births & Baptisms 1813-1906 (http://www.ancestry.co.uk) 28 Feb 1845: Thomas son of John & Sarah Uridge of Sydenham, a Labourer. [S59] E-mail from Mary Jane Gill to Teresa Pask dated 8 July, 2000; (gives baptism date as 28 February 1845). [S127] Baptisms Transcript, St. Bartholomews, Sydenham, Kent, 1832-1919 "Caroline Sarah d Thomas & Harriet Elizabeth URIDGE, 4 Melrose Cottages, Sydenham, Labourer. Bp 15 Mar 1868." [S25] Index of Baptisms, Marriages & Burials in the Parish of Lewisham, St Mary. [S653] Image of the 1871 census for Lewisham, London: RG10 Piece 770 Folio 6 Page 6. [S466] Copy marriage certificate of Thomas Uridge and Harriet Clark (29 March 1874). [S656] E-mail from Brian Fallon to Teresa Pask dated 16 August 2005. Boat Howrah, 1874. Kindly transcribed by Judith Batt. [S332] E-mail from Judith Batt to Teresa Pask, dated October 25, 2002 : New Zealand Wise Directories. [S332] E-mail from Judith Batt to Teresa Pask, dated October 25, 2002 : New Zealand Electoral Rolls. [S332] E-mail from Judith Batt to Teresa Pask, dated October 25, 2002 : New Zealand Probates. [S332] E-mail from Judith Batt to Teresa Pask, dated October 25, 2002 : Karori Cemetery - Wellington. [S332] E-mail from Judith Batt to Teresa Pask, dated October 25, 2002 : New Zealand Deaths 1897 December quarter, No. 2030. [S878] Website Births, Deaths & Marriages Online New Zealand (https://www.bdmhistoricalrecords.dia.govt.nz/home/) Deaths: 1897/5868 Uridge Thomas 53Y. [S14] E-mail from Christine Thomas to Teresa Pask dated 16 May 2000. [S360] Website Edwards World Connect (http://worldconnect.rootsweb.com) searched 5 December 2001. [S878] Website Births, Deaths & Marriages Online New Zealand (https://www.bdmhistoricalrecords.dia.govt.nz/home/) 1875/13853 Uridge John Joseph Harriet Elizabeth Thomas. Harriet died on 14 January 1929 at the age of 85.21,22,23 She was buried at Plot 08/B/O2/011, Karori Cemetery, Wellington, New Zealand; Monumental Inscription reads: "In loving memory of Thomas URIDGE d 25 Oct 1897 a 53 yrs. Harriet HAIR (URIDGE) d 14 Jan 1929 a 85 yrs. 'Absent from the body, present with the Lord'. [Munro]4"
[S656] E-mail from Brian Fallon to Teresa Pask dated 16 September 2005. [S654] Image of the 1861 census for Camberwell, Surrey: RG9 Piece 0388 Folio 33 Page 15 Enumerated under the name of WOUD. [S466] Copy marriage certificate of Thomas Uridge and Harriet Clark (29 March 1874) . "She was a widow at the time of her marriage in 1874." [S332] E-mail from Judith Batt to Teresa Pask, dated October 25, 2002 : New Zealand Pandora's Box - Electoral Rolls. Millie Mary DEAR22 b. 1903? [S2] GRO Indexes to Births "1868/Q1 Lewisham 1d 958." [S344] E-mail from Judith Batt to Teresa Pask, dated October 31, 2002 : NZ Marriages 1890 No. 3140. [S878] Website Births, Deaths & Marriages Online New Zealand (https://www.bdmhistoricalrecords.dia.govt.nz/home/) Marriages: 1890/3405 Caroline Sarah Uridge = Walter James Dear. [S345] E-mail from Judith Batt to Teresa Pask, dated November 1, 2002 : NZ Electoral Roll 1893 No. 3113 & 3115. [S345] E-mail from Judith Batt to Teresa Pask, dated November 1, 2002 : NZ Deaths 1952 Wellington, March quarterNo. 719. [S792] E-mail from Linda Dear to Teresa Pask dated February 6, 2007. [S345] E-mail from Judith Batt to Teresa Pask, dated November 1, 2002 : NZ Births 1891 Wellington, December quarter No. 3649. [S345] E-mail from Judith Batt to Teresa Pask, dated November 1, 2002 : NZ Births 1893 Wellington, December quarter No. 3811. [S345] E-mail from Judith Batt to Teresa Pask, dated November 1, 2002 : NZ Births 1893 Wellington, December quarter No. 3807 (to be verified). [S345] E-mail from Judith Batt to Teresa Pask, dated November 1, 2002 : NZ Births 1897 Wellington, September quarter No. 2827. [S345] E-mail from Judith Batt to Teresa Pask, dated November 1, 2002 : NZ Births 1901 Wellington, June quarter No. 1785. [S345] E-mail from Judith Batt to Teresa Pask, dated November 1, 2002 : NZ Births 1903 Wellington, June quarter No. 646. [S345] E-mail from Judith Batt to Teresa Pask, dated November 1, 2002 : NZ Births 1903 Wellington, December quarter No. 4573 (to be verified). [S345] E-mail from Judith Batt to Teresa Pask, dated November 1, 2002 : NZ Births 1907 Wellington, March quarter No. 728. [S2] GRO Indexes to Births "1858/Q3 URIDGE, Edgar Fredrick St Luke 1b 546." [S4] GRO Indexes to Deaths "1858/Q3 St Luke 1b 546." [S1075] 1881 Census RG11 Piece 0365 Folio 81 Page 14. [S3] GRO Indexes to Marriages "1884/Q4 Holborn 1b 1141." [S1077] 1901 Census RG13 Piece 257 Folio 52 Page 41. [S4] GRO Indexes to Deaths "1932/Q1 URIDGE, Edgar Frederick Islington 1b 384 age 76." Research Note: Research Note: Unable to locate William in the 1891 and 1901 although I have searched extensively. During this time, he was deemed to have died and his wife Caroline married again. [S240] E-mail from Christine Thomas to Teresa Pask, 27 November 2000 containing Uridge births, deaths and marriages certificates. "Son Henry Adolphus Umpton Uridge's certificate states father as William John URIDGE." [S2] GRO Indexes to Births "1843/Q1 URIDGE, William Lewisham 5 301." [S14] E-mail from Christine Thomas to Teresa Pask dated 10 July 2000. [S75] E-mail from Ronald James Uridge to Teresa Pask November 4, 2000. Date of Birth: 28 December 1842. [S240] E-mail from Christine Thomas to Teresa Pask, 27 November 2000 containing Uridge births, deaths and marriages certificates. "Birth certificate of Ernest Albert states father William, and mother Caroline Uridge nee Poynter." [S14] E-mail from Christine Thomas to Teresa Pask Marriage certificate held. [S3] GRO Indexes to Marriages "1862/Q3 URIDGE, William = POYNTER, Caroline Windsor 2c 632." [S274] Copy marriage certificate of William Uridge and Caroline Poynter (September 15, 1862). Kindly provided by Christine Thomas. [S536] Image of the 1871 census for Lewisham, London: RG10 Piece 770 Folio 18 Page 29 Indexed incorrectly under the name of ALRIDGE. [S535] Image of the 1871 census for Lewisham, London: RG10 Piece 770 Folio 17 Page 28 Indexed incorrectly under the name of ALRIDGE. [S275] Copy birth certificate of Alice Poynter Uridge (13 October 1877). [S4] GRO Indexes to Deaths "1917/Q3 URIDGE, William Greenwich 1d 844 age 75." [S367] Copy death certificate of William Uridge (2 July 1917). [S197] Copy birth certificate of Ernest Albert Uridge (25 January 1876). Kindly provided by Christine Thomas. [S198] Copy marriage certificate of William Joseph Lippiatt and Alice Maud Poynter Uridge (14 October 1899). [S240] E-mail from Christine Thomas to Teresa Pask, 27 November 2000 containing Uridge births, deaths and marriages certificates. "Son Henry Adolphus Umpton Uridge's certificate states mother as Caroline Janette URIDGE, formerly Poynter." [S14] E-mail from Christine Thomas to Teresa Pask dated 9 November 2000. [S14] E-mail from Christine Thomas to Teresa Pask Marriage certificate of William & Caroline. [S2] GRO Indexes to Births "1876/Q1 URIDGE, Ernest Albert Windsor 2c 436." [S75] E-mail from Ronald James Uridge to Teresa Pask dated 4 November 2000. [S14] E-mail from Christine Thomas to Teresa Pask dated 11 October 2000. [S3] GRO Indexes to Marriages "1883/Q4 URIDGE, Caroline = COLEMAN, William Easthampstead 2c 893." [S369] Copy marriage certificate of William Coleman and Caroline Uridge (10 November 1883). Kindly provided by Christine Thomas. [S132] Copy marriage certificate of George Uridge and Caroline Giles (24 September 1887). [S3] GRO Indexes to Marriages "1887/Q3 URIDGE, George = GILES , Caroline Windsor 2c 683." [S6] Teresa Pask's Guesses, Theories and Speculation : A Caroline COLEMAN entered LDS church on June 1907. [S14] E-mail from Christine Thomas to Teresa Pask dated 28 August 2000. [S2] GRO Indexes to Births "NOT registered under URIDGE in GRO." Elizabeth Emily daughter of William & Caroline URIDGE of Peak Hill, Sydenham, a Labourer Born 3 December 1867. [S2] GRO Indexes to Births. [S3] GRO Indexes to Marriages "1855/Q3 URIDGE, Elizabeth = HARMAN, John Henry Kensington 1a 197." [S920] Copy of Marriage Register from www.ancestry.co.uk for John Henry Harman and Elizabeth Uridge at St. Mary's Church, Paddington, London, 30 July 1855. [S667] Image of the 1871 census for 1 Westbury Terrace, Paddington: RG10 Piece 15 Folio 17 Page 25-26 Enumerated under the name of WURIDGE. 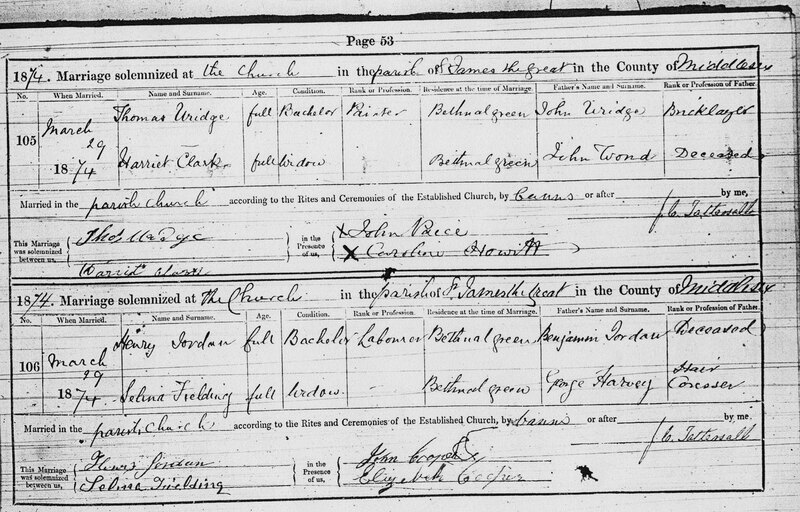 [S921] Copy of Marriage Register from www.ancestry.co.uk for William Webb and Elizabeth Harman at Trinity Church, Paddington, London, 8 November 1874. [S668] Image of the 1861 census for 3 Upper Brook Mews, Paddington: RG9 Piece 7 Folio 134 Page 53 Indexed incorrectly under the name of VRIDGE. In a document dated c1905, she is referred to as "(alive) now or formerly in Cane Hill Asylum Coulston [Coulsdon] born 11th Nov 1847.4"
Research Note: The Cane Hill Asylum, Coulsdon is well documented on the internet, see http://www.madgroup.co.uk/canehill/history.htm and http://www.explorationstation.co.uk/canepage.html. [S2] GRO Indexes to Births "1847/Q4 URIDGE, Ellen Lewisham 5 300." [S746] Image of the 1891 census for District London County Lunatic Asylum, Coulsdon, Surrey: RG12 Piece 0600 Folio 138 Page 32. [S747] Image of the 1901 census for District London County Lunatic Asylum, Coulsdon, Surrey: RG13 Piece 0635 Folio 118 Page 12. [S445] E-mail from Bob Morgan to Teresa Pask dated 13 August 2004: Bob writes: "John FUNNELL, a plasterer, and Ellen URIDGE are shown as the parents of Alice. In the 1881 Census the URIDGE family were living at 32 Springfield, Sydenham and next door at 34 Springfield lived a FUNNELL family with son John aged 13. The father Amos's occupation is shown as Plasterer." [S532] Image of the 1881 census for Sydenham, Kent: RG11 Piece 0737 Folio 54 Page 36. [S2] GRO Indexes to Births "1852/Q1 URIDGE, Emily Lewisham 1d 597." [S59] E-mail from Mary Jane Gill to Teresa Pask dated 8 July, 2000; (1850). [S127] Baptisms Transcript, St. Bartholomews, Sydenham, Kent, 1832-1919 Emily d John & Sarah URIDGE, Sydenham, Labourer. [S127] Baptisms Transcript, St. Bartholomews, Sydenham, Kent, 1832-1919 Emily URIDGE of Sydenham aged 1yr 6 mths. In a document dated c1905, she is referred to as "Emma Uridge born at Forest Hill in 1852 married and became Mrs Sutton is alive and now resides 264 Oxford Street, Woollahra, Sydney, New South Wales, Australia.12"
[S2] GRO Indexes to Births "1851/Q4 URIDGE, Emma Lewisham 5 354." [S1074] 1871 Census Birthplace: Sydenham. [S127] Baptisms Transcript, St. Bartholomews, Sydenham, Kent, 1832-1919 Emma d George & Ann URIDGE, Bricklayer, Sydenham. [S15] Letter from Kevin Brady to Teresa Pask dated 28 April 1987. [S957] Vital Records Index: Australian 1788-1905, Ref Number: 163. [S387] Baptism, St. Clement Danes, Middlesex, Page 353 January 1835. [S370] E-mail from Esme Mitulla to Teresa Pask dated 8 January 2003. [S370] E-mail from Esme Mitulla to Teresa Pask dated 3 January 2003. [S387] Baptism, St. Clement Danes, Middlesex, Page 353 January 1835 "11 January 1835: Frances, George & Ann Uridge of 2 Milford Lane, a Carman." [S1075] 1881 Census RG11 Piece 0029 Folio 30 Page 3. Age given as 43. [S1076] 1891 Census RG12-21 Folio 123 Page 38. Age given as 54. [S729] Image of the 1851 census for St. George, Bloomsbury, London: H0107 Piece 1507 Folio 192 Page 53. [S3] GRO Indexes to Marriages "1862/Q4 URIDGE, Frances = BRIDGFOOT, Francis Kensington 1a 2." [S922] Copy of Marriage Register from www.ancestry.co.uk for Francis Bridgfoot and Frances Uridge at St. Matthews, Bayswater London, 13 November 1862. [S923] Image of the 1871 census for Richmond Road, Kensington, London: RG10 Piece 0036 Folio 57 Pages 14-15 Enumerated under the name of BRIDGFORT. [S1075] 1881 Census RG11 Piece 0029 Folio 30 Page 3. [S1076] 1891 Census RG12 Piece 21 Folio 123 Page 38.